Top photo: John Frederick congratulates Outstanding and Distinguished T.A. 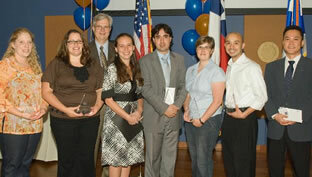 Award winners (from left) Gabrielle Haby, Lydia Overbaugh, Carla Pezzia, Ruben Mancha, Megan Sibbett, Jose A. Gutierrez and Jaehon Lee. (May 11, 2010)--A large crowd including deans, department chairs, faculty, family members and fellow teaching assistants clapped and cheered at a recent ceremony for graduate students honored for their commitment to teaching and learning. Hosted by the Teaching and Learning Center (TLC) and the Graduate Student Association (GSA), the awards event in the University Center Ballroom on the Main Campus included presentation of T.A. Certificates in College Teaching, faculty Apple Awards, recognition of the University Teaching Fellows (UTFs) and Distinguished T.A. Awards. John Shaffer, assistant director of recruitment and retention and the GSA sponsor, was master of ceremonies. John Frederick, provost and vice president for academic affairs, and Dorothy Flannagan, vice provost and dean of the Graduate School, presented the certificates and trophies. The ceremony was followed by a reception honoring the award recipients. In opening remarks, Frederick said support for graduate students is an essential component of UTSA's goal to become a Tier One research institution. He said graduate students support undergraduate education, making it a double win for the university. He closed his remarks relating a personal anecdote. When his daughter, at age 10, was an aspiring violinist, they were listening to a Tchaikovsky violin concerto. He asked if she thought she could play the piece, expecting a definite "no" that would inspire him to offer words of encouragement about hard work, practice and determination. Instead, her "no" was qualified by the words, "because I don't have the music." He said to the T.A.s in the audience, "We have a population here at UTSA who are first-generation students. They need the 'music' that you can provide." Frederick and Flannagan awarded Certificates in College Teaching to teaching assistants who had completed requirements including T.A. orientation, conducting classroom observations, attending workshops and completing an online Family Education Rights and Privacy Act (FERPA) module. 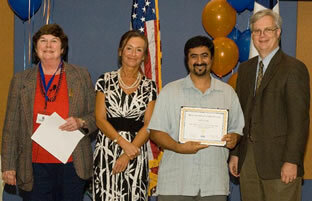 Forty-three TAs earned certificates, 13 with distinction, bringing the total earning certificates at UTSA to more than 200 students from a variety of departments. Seok Kang (Communications) and Sonja Lockhart (English) received the TLC Apple Award for their commitment to teaching and learning and commitment to T.A. workshops. Teaching-related books also were presented to faculty members Patti Geppart (Biology), Cherylon Robinson and Michael Miller (Sociology) and Thomas Thomson (Finance). Barbara Millis, TLC director, expressing her joy in working with the fellows, who are funded by the provost's office. "The fellows have worked all year to hone their professional skills, attending workshops and teaching conferences and meeting weekly to discuss teaching issues," she said. "Each is completing a capstone course on a teaching-related topic, many in support of special initiatives within their own departments. Additionally, they have served the university by mentoring cohorts of graduate students earning the Certificate in College Teaching." The fellows presented Frederick with a framed photo of themselves taken with him and a clock with the inscription, "Thank you, John Frederick, for your support." The 2009-2010 University Teaching Fellows are Sreerenjini Chandrasekharan (Physics and Astronomy), Laura Ellis-Lai, (English), Yifeng Guo (Computer Science), Hsiu-Chen Hsu (Bicultural-Bilingual Studies), John Joseph (Civil and Environmental Engineering), Rebecca Joy, (Chemistry), Lynn Kim (Anthropology), Christopher Leeth (Counseling), Burcu Ozsoy-Cicek (Geological Sciences) and Nicole Provencher (English). The Distinguished T.A. Award was presented to students in two tracks, the science, technology, engineering and math (STEM) disciplines including anthropology, and the humanities, social sciences and professional schools (HSSPS) track. The selection committee, composed of Mary McNaughton-Cassill, Diane Abdo, Michael Ryan, Kim Kline and John Shaffer, also received special recognition for its hard work. Purasker Ingale represented the Graduate Student Association on the committee. Graduate students receiving Teaching Recognition Award certificates in the HSSPS track were Shereen Bhalla, Hsiao-Ping Wu, Larissa Mercado-Lopez, Erin Ranft, Estaban Delgado and Catherine Pell. In the STEM track, Xia Li, Dragana Veljkovic-Perez and Crissy Ruffo received awards. For the Outstanding Teaching Award, students received a trophy and a check for $150: In the STEM category, they were Gabrielle Haby, Carla Pezzia and Lydia Overbaugh, and in the HSSPS category, they were Elaine Wong, Jose Gutierrez and Jaehoon Lee. Two graduate students were honored in each category with a trophy and a check for $300 for receiving the top honor, the Distinguished Teaching Assistant Award. They were Ruben Mancha (Information Systems and Technology Management) and Megan Sibbett (English).